If the world was to suffer a nuclear holocaust the only surviving life form would be houseguests! Ahhhhh! 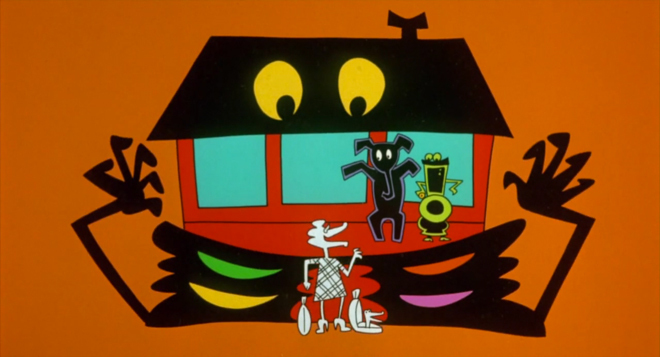 Director Tom Ropelewski’s 1990 goofball comedy Madhouse begins on a high note: with an exuberant opening sequence directed by Animator Sally Cruikshank. 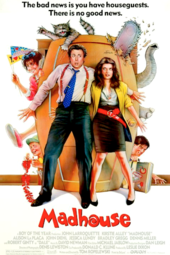 The film is a story of unwelcome and uncouth houseguests and the chaos and comedy they inspire in the household of Mark (John Larroquette) and Jessie (Kirstie Alley). In Cruikshank’s animated opening, a magenta, lady-like character emerges from a manhole and visits a bouncing abode full of colourful characters. As Chris Rea croons “Let’s Dance”, a plaid valise erupts in a throng of dancing figures. The titular madhouse appears, bookended by shimmying palm trees and brimming with creatures lost in a deep groove, pulsing in colour. 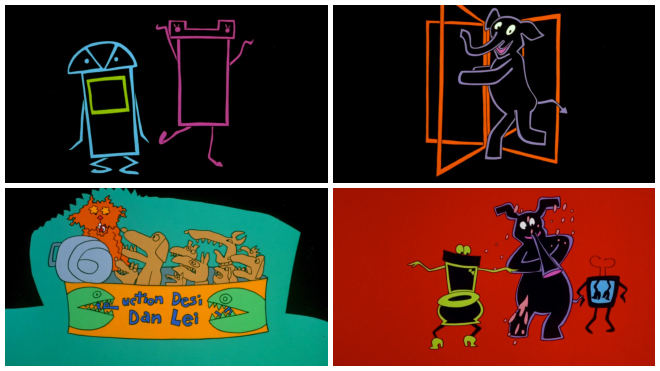 Because this is a Sally Cruikshank sequence, everything is alive. The trees transform into arms and the house looks around, its eyes roving around in the arched transom. Our pink lady – Jessie’s sister Claudia (Alison La Placa) in caricature – approaches the door and knocks. The house lets its pants down, revealing an elephant and a toilet within. The toilet wears high heels and walks across the screen, streaming toilet paper and bedlam. When cartoon Claudia knocks again, she is forcefully denied, a set of bars and a lock slamming down before her. Naturally, she forces her way in, driving a tank through the doorway. What follows is a set of dancing doors, televisions, mice, and snakes, a cat on the loose, and a revolving door of characters squeezed together in beds and sardine cans. The dancing, multicolour figures and animals playing instruments recall the “Pink Elephants on Parade” scene in Dumbo (1941) or the heffalumps and woozles of Winnie the Pooh and the Blustery Day (1968). Peace is restored and the sequence comes to an end when the elephant bumps Claudia off into a pit, flushing her into the ether. The sequence wraps up tidily as Claudia is swallowed by a circle on black, mirroring the first moments. 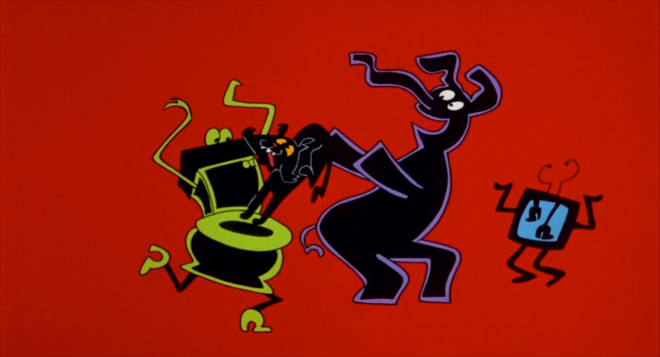 Madhouse was the last of several title sequences Cruikshank created for comedies in the late ’80s, a period which also included the titles for Mannequin, Ruthless People, and Loverboy. It’s a solid and engaging entry in an era that allowed animated opening sequences to flourish before being swept away in the ebb and flow of film. 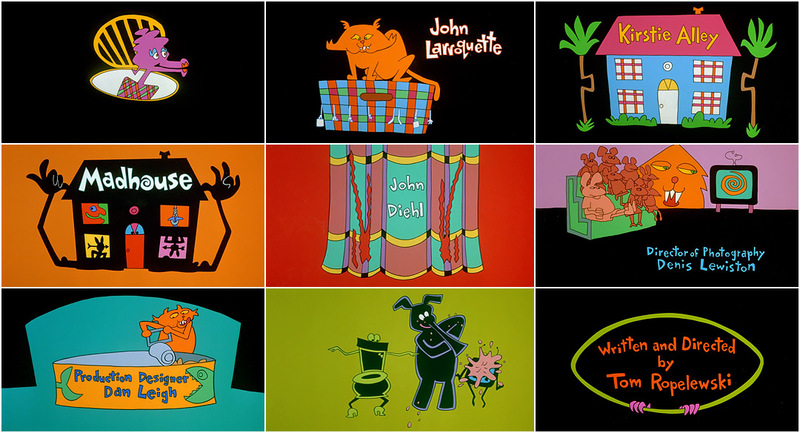 Title Designer SALLY CRUIKSHANK speaks about her work on Madhouse in this excerpt from our feature article Sally Cruikshank: A Career Retrospective. Sally: I looked at those titles today and I thought, you know, I like this. This one was one where I liked the song. “Let’s Dance” by Chris Rea. We had the music in advance. I could direct the animators very closely to the music. I think the goofy character with the buns on her hair — I really liked the way she’s animated. I really like the way we did all the looks. Except for the sound effects, again! [laughs] Playhouse was producing it and they just had different ideas about sound and how to design that. Did you get any direction from the filmmakers for Madhouse? Sally: Well, I was directing the sequence, but, you know, I designed it and then I would pass on the layouts and Gerry would talk to the animators about what I wanted. They really did a good job on that one. Because it was about a whole bunch of people coming to stay in one house, it has a lot of little shots in the titles where there are many characters, and everybody’s doing something different. And they’re doing it to the music, too! Sally: That cat, yeah! The titles look better on film and cel than they do on YouTube, of course. That’s always the way.